As reprehensible as Qaddafi’s regime is, it is important to be on our guard against psyops–disinformation efforts designed to sway public opinion. The Pentagon and CIA, as well as agencies of many other countries, have extensive operations focused on this objective. In the latest turn in the case of Eman al-Obeidy, a Libyan woman apprehended by security forces for trying to tell journalists that she had been raped by members of Col. Muammar el-Qaddafi’s militia, a government spokesman said Tuesday that the unidentified militia members she accused had filed a civil case against her. Journalists have been unable to learn Ms. al-Obeidy’s whereabouts since she was removed by force from the Rixos Hotel here after scuffles between security personnel, hotel staff and foreign journalists she had been trying to approach on Saturday. Mr. Ibrahim initially described her as drunk and potentially delusional. Then, later on Saturday, he called her sober and sane. And on Sunday he termed her a prostitute and a thief. He said that her case against the men had been dropped because she refused to submit to a medical examination, and he reiterated a promise that she would be offered a chance to speak again to the press. 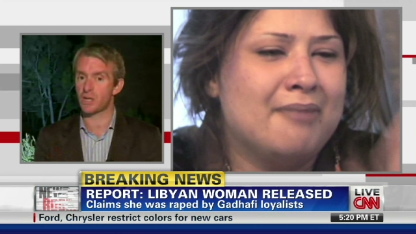 The story of her treatment, covered by satellite news channels and Web sites, has riveted Libyans of all stripes. To critics of the Qaddafi government Ms. Obeidy has become the new face of its brutal tactics. Her family and tribe, based in the rebel-held east, is reportedly standing by her, bucking tradition to reject any assertion of a stain on her reputation from the alleged sexual crime. Rebels in Benghazi, the de facto rebel capital, have also held rallies to support her. At the Human Rights Caucus, however, Hill & Knowlton and Congressman Lantos had failed to reveal that Nayirah was a member of the Kuwaiti Royal Family. Her father, in fact, was Saud Nasir al-Sabah, Kuwait’s Ambassador to the US, who sat listening in the hearing room during her testimony. The Caucus also failed to reveal that H&K vice-president Lauri Fitz-Pegado had coached Nayirah in what even the Kuwaitis’ own investigators later confirmed was false testimony. So, let’s be hyper-vigilant in these crucial early days of war creep. There are 11 comments Our Comment Policy: Keep it civilized, keep it relevant, keep it clear, keep it short. Please do not post links or promotional material. We reserve the right to edit and to delete comments where necessary.